This weekend, leaders from Ole Miss Greek life convened upon Camp Hopewell in Lafayette County for a three-day retreat designed to build leaders and bring campus closer together. 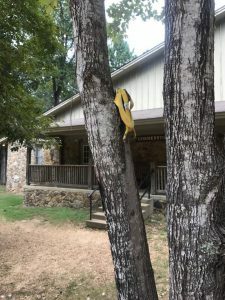 The retreat was cut short Saturday night, however, after three black students found a banana peel in a tree in front of one of the camp’s cabins. The students shared what they found with National Pan-Hellenic Council leaders, sparking a day’s worth of camp-wide conversation surrounding symbolism, intended or not. In the midst of the open and sometimes heated discussion, senior accounting major Ryan Swanson said he put the banana peel in the tree when he could not find a trashcan nearby. Alexa Lee Arndt, interim director of Fraternity and Sorority Life, said she was one of the only university staff members acting in an administrative capacity at the weekend retreat. Monday afternoon, she sent a letter to all campus chapter presidents, council officers and chapter advisers, confirming the incident and outlining the university’s plans. “To be clear, many members of our community were hurt, frightened, and upset by what occurred at IMPACT … Because of the underlying reality many students of color endure on a daily basis, the conversation manifested into a larger conversation about race relations today at the University of Mississippi,” Arndt wrote in the letter acquired by The DM. Student members of Panhellenic Council, National Pan-Hellenic Council and Interfraternity Council were all present at the retreat, which was organized by Fraternity and Sorority Life and the national group IMPACT. IMPACT is a campus-based leadership institute designed to foster improved relationships among campus leaders through a retreat-type program. Makala McNeil, president of Alpha Kappa Alpha sorority, one of the nine historically African-American sororities and fraternities, said she saw the banana peel after leaving a group discussion that addressed race relations. Saturday morning, all of the retreat’s participants ate breakfast together, followed by a session where they shared their feelings on race relations at Ole Miss. The breakfast options included a fruit cart with bananas. This photo was circulated among students over the weekend in group messages and was provided to The Daily Mississippian. After the large discussion session, the students split into smaller conversation groups. McNeil said that around noon on Saturday, she was walking with friends to their group session across camp when one of her sorority sisters pointed at a tree 15 feet away. She said that about six feet up the tree’s trunk sat a lone, fresh-looking banana peel. She said the image was especially disturbing in light of an incident on American University’s campus in May of this year. The morning Taylor Dumpson was to take over as the school’s first female black student government president, students found bananas hanging from nooses across campus. Some of the bananas were inscribed with references to Dumpson’s sorority, Alpha Kappa Alpha. “That, to me, was a slap in the face to see that banana hanging in a tree after talking about the personal truths of our campus,” McNeil said. McNeil said that by lunchtime, people throughout the camp knew about the incident. As lunch rolled into the afternoon discussion group, the banana peel dominated chatter. That afternoon’s group discussion session served as an open forum on the incident. “As the staff member responsible for the wellbeing of our community, I felt it was imperative to provide space immediately to students affected by this incident to allow them an opportunity to voice their pain and concern,” Arndt wrote in her statement. At the start of this session, McNeil said one black student stood up and asked that everyone there google the American University incident to understand the banana peel’s significance. She said he explained how bananas have historically been used to demean black people. McNeil said her sorority sister then raised her hand to simply ask who put the peel in the tree. She said Swanson stood up and came forward almost immediately after the question. He apologized and said he did not mean any harm by leaving the peel in the tree. “I want to sincerely apologize for the events that took place this past weekend,” Swanson said in a statement to The DM on Tuesday night. “Although unintentional, there is no excuse for the pain that was caused to members of our community. McNeil said that if the banana peel incident was an accident, people need to consider the effects of their actions versus their intent. “You see how much fear and how much anger you insight in black people just from an unintentional image,” she said. The conversation carried on, and tensions continued to rise. White and black members of the Ole Miss Greek community shared their views on the day’s events and race relations in general. McNeil said people had a lot to say, but the conversation began to move in an unhealthy direction. The massive discussion session wrapped up as more and more students stood and left the room – some in tears, some in frustration. NPHC members began texting friends to come and pick them up from the camp since no one had been allowed to drive his or her car up to the retreat. The remainder of the retreat was canceled later that night. Katrina Caldwell, vice chancellor for diversity and community engagement, said her office was asked to put a plan together to handle the weekend’s incident on campus. “Right now, we’re just talking to people on campus who have some experience working across diversity to help the students process what happened,” Caldwell said. Caldwell said she needs to talk with a couple more faculty members before deciding “what makes the most sense” for the campus. Arndt said it was important for the vice chancellor for diversity and community engagement to lead the response. Arndt reached out to Caldwell on Saturday night. “We want to be sensitive to already-scheduled events that are taking place but also do not want to delay having these important follow-up conversations,” Arndt’s statement said.